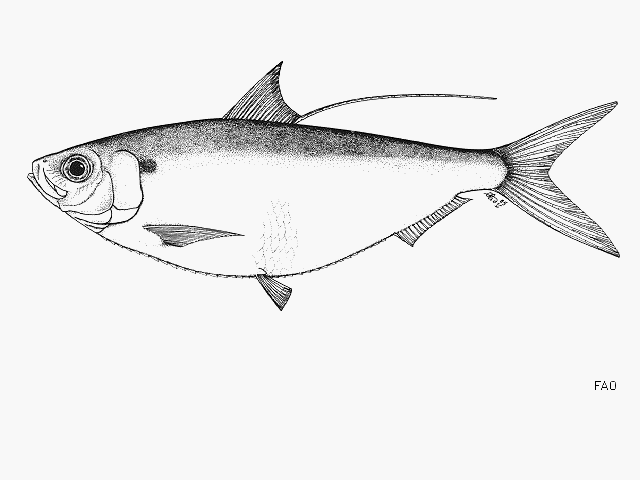 Pacific thread herring has an Eastern Pacific distribution from Mexico to Peru, but no studies on its stock structure could be located. This profile describes the Panamanian fishery. Inspections are conducted to ensure no shrimp is caught during its closed season. The minimum landing size is defined at 16cm. A fisheries monitoring program for small pelagics resources started in May 2013. There are no reference points in place. 1. Perform a stock assessment as soon as enough data are available from historic catch and effort data and the new fishery monitoring program. 2. Establish a management plan, including reference points and a harvest strategy that account for the extreme ecological importance of these fish in the food web. 3. Conduct research to better describe this fishery’s impact on the ecosystem with respect to bycatch and gear impacts on the seafloor. 1. Contact (and/or ask your supply chain to contact) the Panama Aquatic Resources Authority (ARAP) to thank them for implementing the new fishery monitoring program. Encourage them to continue to expand their research and monitoring capabilities to allow them to establish a management plan that includes reference points and a harvest strategy that account for the extreme ecological importance of these fish in the food web. 2. Engage and support the existing Fishery Improvement Project. The Panamanian small pelagics appear to be, at the least, fully exploited considering the recent stable landing and effort levels and an increase in fishing effort for thread herring is to be avoided (CeDePesca, 2010a). Abundance is highly correlated with environmental factors, particularly upwelling and rainy seasons. The fishery expanded in the 1960s with the increased demand for fishmeal and fish oil, and with the exception of a decrease in the mid-1980s, catches gradually increased to a peak of 59,000 tons in 2002. Catches have decreased since then, and have averaged just over 30,000 tons since 2005 (FAO, 2012; Contraloría General de la República de Panamá, 2012). The minimum landing size is defined at 16 cm. A fisheries monitoring program for small pelagics started in May 2013 (ARAP, 2013). Industrial vessels must be equipped with Vessel Monitoring System (VMS)and inspections are conducted during the prawn closures to ensure no bycatch is occurring. No issues related to compliance with regulations are known. Pacific anchoveta and Pacific bumper are also part of the small pelagics fishery. There is retained bycatch of shrimp by the fishery, particularly when fishing near the coast, but this is forbidden during the several closures enforced during the year. Demersal fish, particularly juveniles, are also caught including weakfish, snappers, snooks, sierras, jacks, bobos as well as lobsters (CeDePesca, 2010a). No scores can be quantitatively calculated as the 2015 stock assessment conducted by CeDePesca (2015) shows preliminary results, and no reference points are defined and no catch limits (TAC) are set. A partial score has been determined for score #1 however, based on available information. Scientific advice is limited so score #2 is not determined. For Score #3 no TAC is set but it is recommended to maintain catches at its recent average (around 35,000 tonnes) and never above 38,000 tonnes. Landings have been lower than 35,000 tonnes for the last 4 years (2011-2014). Score #4 cannot be allocated quantitavely as no assessment of stock biomass or abundance is conducted. However, a partial score has been determined for score #5. Preliminary values for fishing mortality are given in CeDePesca (2015). F at age 1 equals 0.255 and is low relative to natural mortality. F at age 2 equal 0.967 and is indicative of catches at a level close to MSY. The fishing mortality levels are considered sustainable, but there is no room for an increase in fishing effort. Last available data on landings are from 1967-2013 (Contraloría de la República de Panamá, 2013) and 2014 preliminar landings reported by CeDePesca (2015) were computed.